Have you ever seen this birthday card before? Maybe not as a birthday card but in movie theater? The background is busy and exciting without being over the top, and the distinct coloration really helps set this birthday card apart from all the others. When someone does you a favor, gives you a gift, or makes you feel special, the best way to show your appreciation is with a Funny Thank You card! 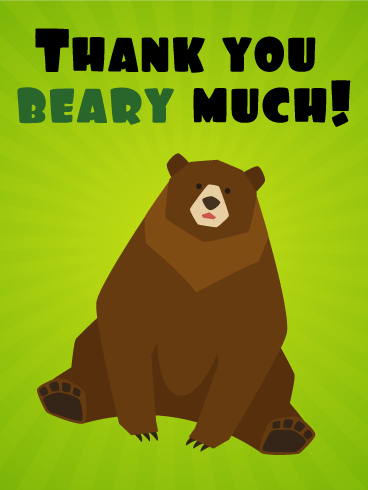 Whether you want to thank a friend or family member, this silly than you card will show that you are "beary" grateful for their sacrifice and assistance. Show your gratitude with this cute thank you card! 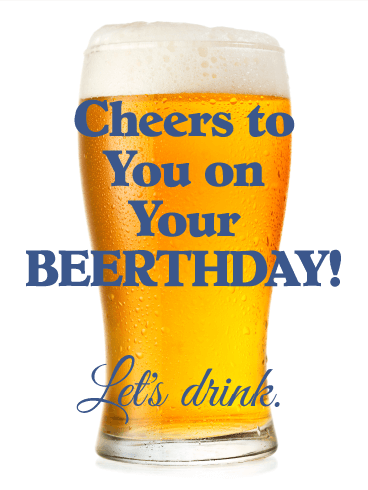 Raise a glass to your good friend on their "beerthday!" 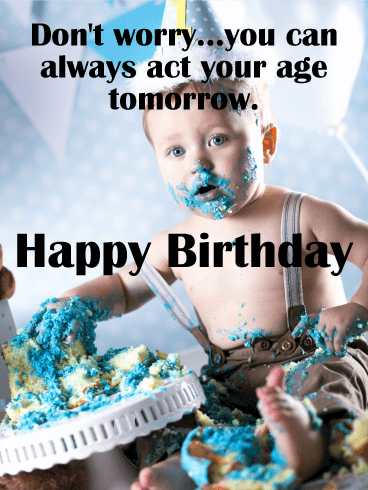 The funny design and humorous birthday message on this Happy Birthday card will help make this a birthday they will never forget! As you celebrate your friend and make the most of their special day, make a toast to show how much you love them and how excited you are for another year in their life! Looking for the perfect birthday card for that person in your life with a great sense of humor?! This funny birthday card is a slam dunk! Combine the old-school television and camera with the antique television and phone and you have a time machine that's sure to send the birthday guy and gal into a frenzy of laughs-and back to their childhood. This is a fun way to wish someone you care about a happy birthday! This birthday card is what birthdays are all about-letting loose, having fun, and enjoying some birthday cake! As if the picture on the birthday card isn't adorable and humorous enough, the joke about acting the proper age is the perfect addition. 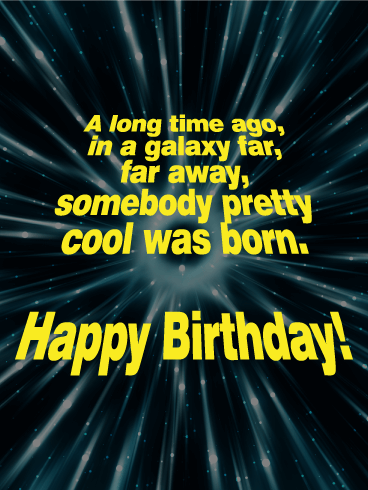 This birthday card is a can't-miss, and everyone's sure to love it! This funny birthday card is the epitome of the saying, "To each their own". Everyone has their own way of celebrating their birthday, and this is the day to do it! Whether you're searching for a funny birthday card for a neighbor or trying to find a fun way to wish your sibling a happy birthday, this is definitely a great choice. It's fun, it's adorable, and it's sure to bring a smile to their face. They're the perfect couple: always together, laughing, loving, dreaming. 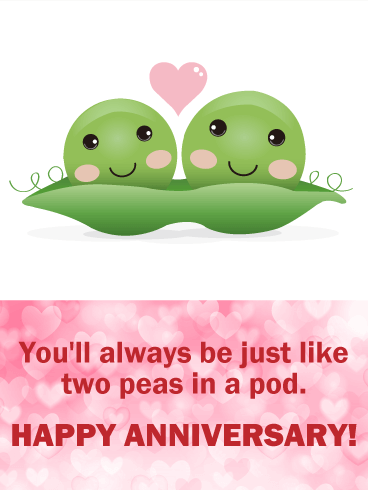 Celebrate these two special people on their anniversary with a sweet and adorable card to remind them they'll "always be just like two peas in a pod." The only thing better than a humorous birthday card is a humorous birthday card with a dog on it! Isn't that the cutest mugshot ever?! Wish someone dear to you a happy birthday with this fun and exciting card. It's sure to make them grin from ear to ear. 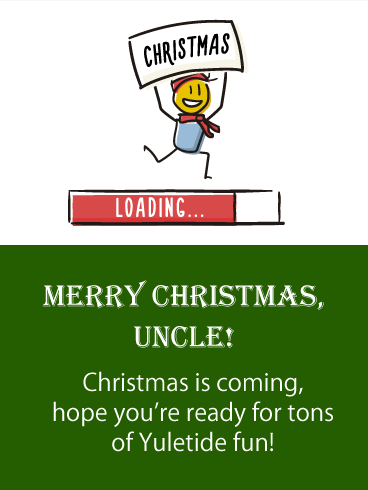 Be it loading a fireplace for a yuletide family gathering, or loading a YouTube video of Christmas choirs wassailing; no Christmas season would be complete without loading your uncles heart with love and gratitude for all that he is and does! Sending this fun Holidays Loading card will remind that charming gent that you are excited that he's a part of your family, and that you get to share Christmas with him. Somebody's gonna be so flippin' excited to get this Christmas card from you! 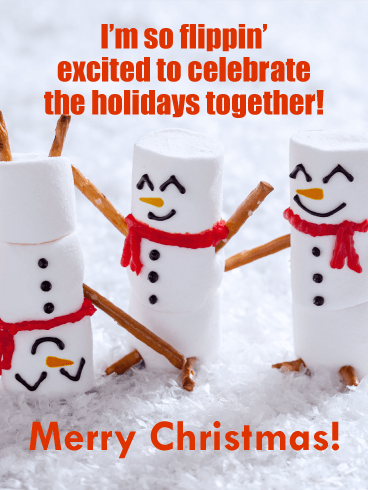 The most adorable marshmallow snowmen are enjoying the holidays to the fullest, pretzel arms raised up high and one even doing a handstand! It's a cute and completely fun way to wish them happy holidays from the heart, while letting them know how much it means to spend time together this time of year. Looks like Santa's getting into the Christmas spirit...and he's ready to pass it along to everyone! 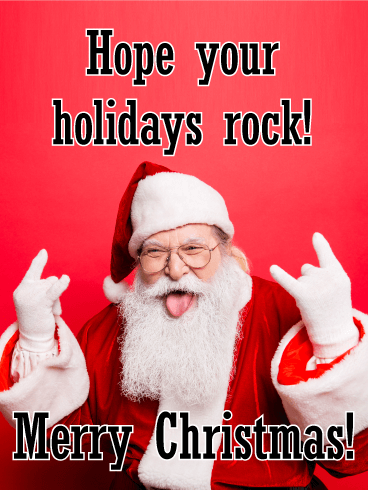 This hysterical card shows Jolly Old Saint Nick rocking out, hands thrown up and tongue sticking out. Anyone who appreciates great big belly laughs will think this greeting is the most awesome one they'll get this season! 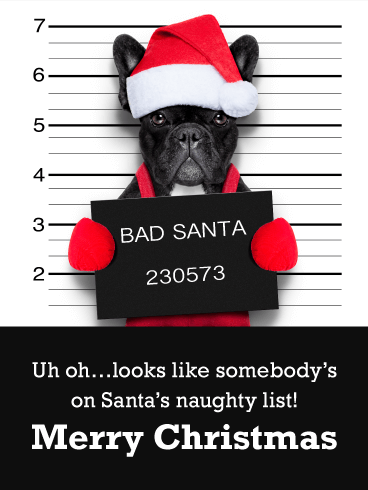 Are they on Santa's naughty list again this year? 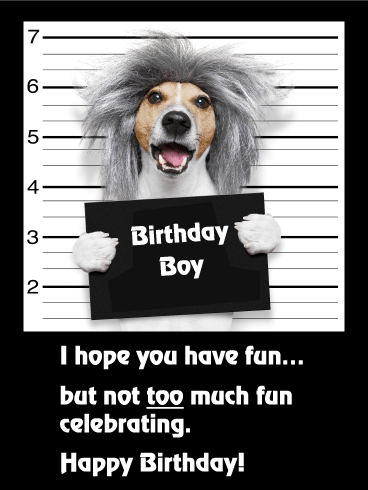 Even so, you can still make them smile with this adorable card, featuring a misbehaving mutt's mugshot! At least he managed to get into the holiday spirit with his Santa hat and suit, even if he may just be getting coal in his stocking. It's a fun Christmas greeting that will have them howling all season long! Most parents can probably relate to their little one waking up really early on Christmas morning to see what's under the tree. 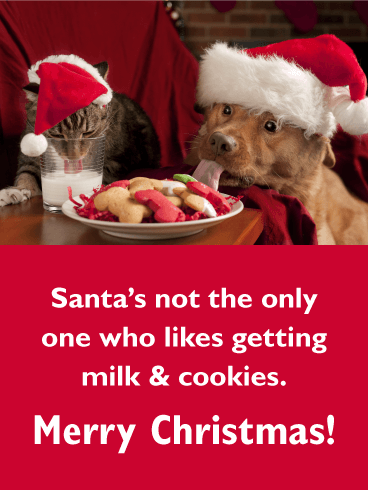 That's what makes this Christmas card so cute and totally funny! 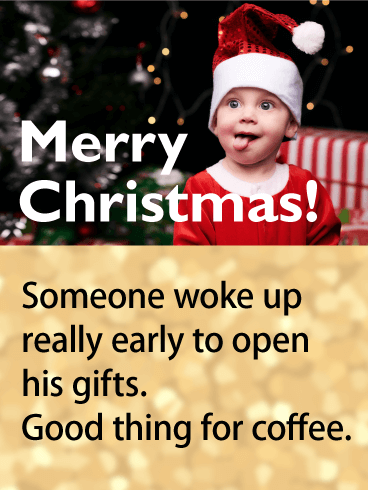 But to make them smile even more is the reminder that no matter how early they're woken up, there's always coffee to get them going (and get them through the day). Then it will be a very Merry Christmas indeed! When there's "snowbody" else you'd rather share happy holiday wishes with, this is the card to send! A snowman stands at the top of a mountain, arms outstretched and wearing his coziest cold weather gear. What a fun & wonderful way to let them know you're thinking of them, while putting a big smile on their face that'll "stick" all throughout the Christmas season! Oh, deer! 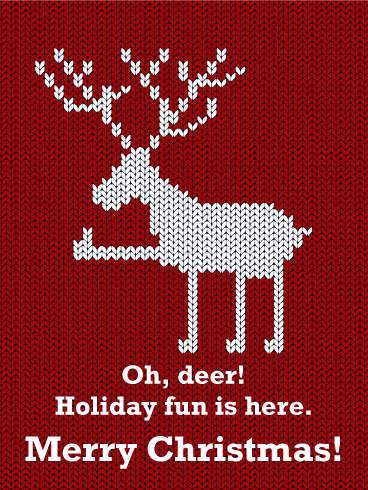 This buck is giving a thumb's up to having lots of holiday fun. 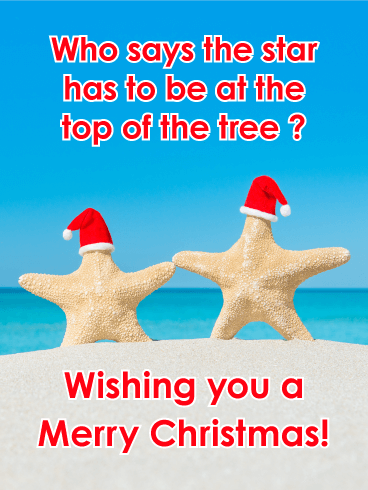 Simple but silly, this seasonal greeting is great for anyone who loves to laugh. Inspired by an ugly Christmas sweater, it features one of Santa's sleigh pullers, pulling out all the stops to make this year very merry. They're sure to be in stitches when they see it! 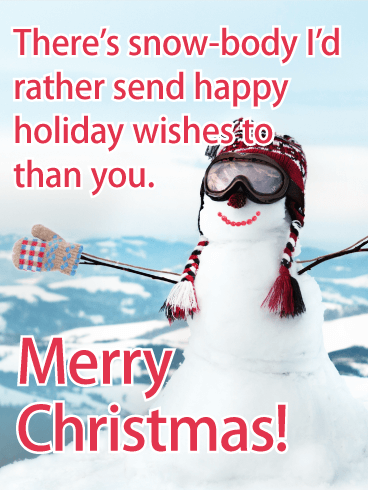 For anyone who enjoys heading to a warmer climate during the holidays (or dreaming of it), this Christmas card is just the greeting to make them smile! Two sea stars are hanging out on the beach, with the ocean behind them, a cloudless sky above and plenty of sun & sand! As their Santa hats reveal, they're definitely getting into the spirit of the season, while providing lots of spirited fun for your recipient (even if they're not sitting at the top of the tree)! 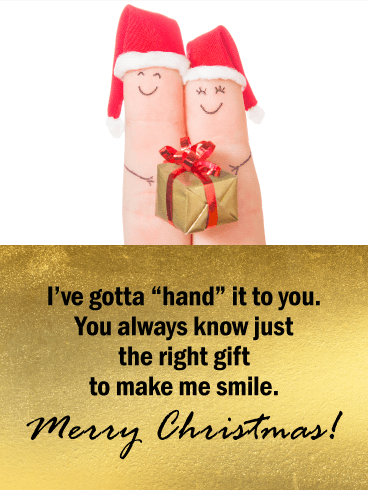 Simple yet so much fun, this holiday card features a happy finger couple, joined together with smiles on their faces and a single present "in hand!" It's a great way to wish someone special a Merry Christmas, while letting them know that they always know how to pick the right gift to make your face light up. 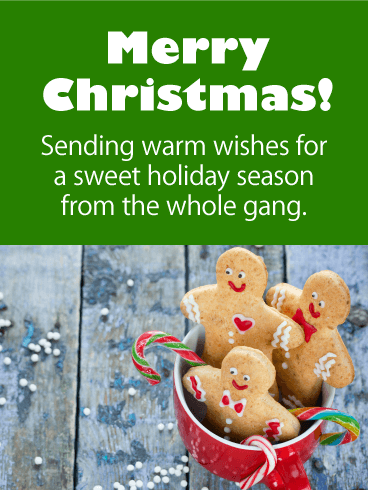 Want to wish someone a sweet holiday season? This card is a fun way to do it! A family of gingerbread people is all warm & cozy inside a cup of cocoa, colorful candy canes hanging out. It's sure to bring a smile to someone's face while melting their heart and making them feel very merry at Christmas time! 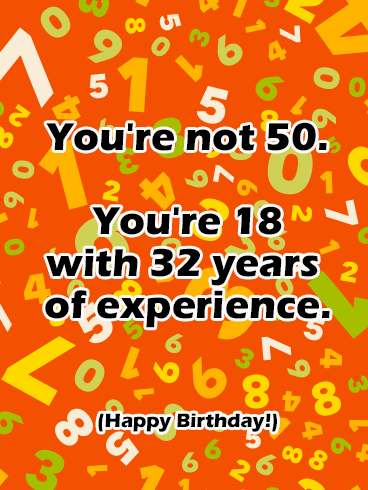 This birthday card is perfect for two main kinds of folks-the ones who love math, and the ones who are going crazy over turning sixty! 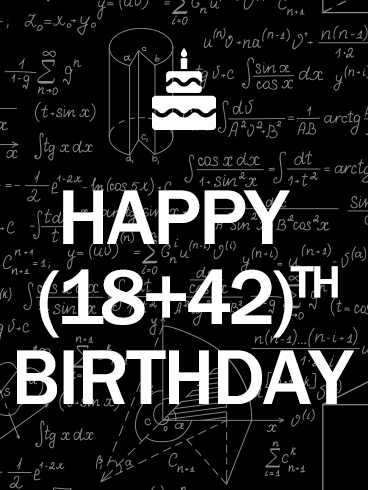 The added element of mathematics makes this birthday card hilarious and fun, while the cake and verbiage still make sure they know you're excited to celebrate your birthday with them. With that fabulous background, what's not to love?! This birthday card is bound to bring a smile to anyone's face! After all, is there anything more celebration-worthy than adorable cats and delicious-looking birthday cake?! The fun colors of this card really take it to the next level. 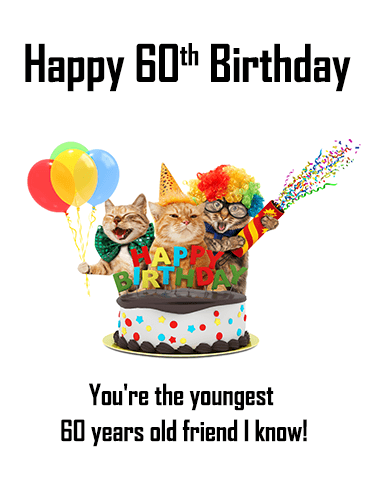 Throw in the added bonus of being called the youngest 60-year-old you know, and the lucky recipient of this birthday card will absolutely love it! 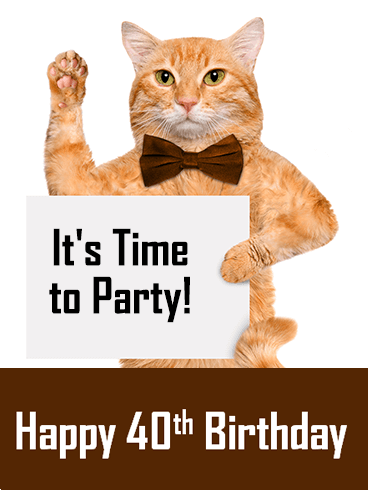 When the bow-tied cat says it's time to party, that means it's time to party! Make the birthday guy or gal smile with this fabulous, cat-themed birthday card. The birthday card is fun without being over-the-top, and the browns and oranges really tie together to catch the eye. 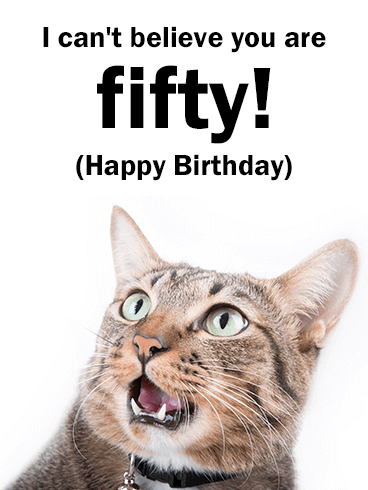 This is sure to be a hit with the cat lover in your life who's celebrating this milestone birthday! 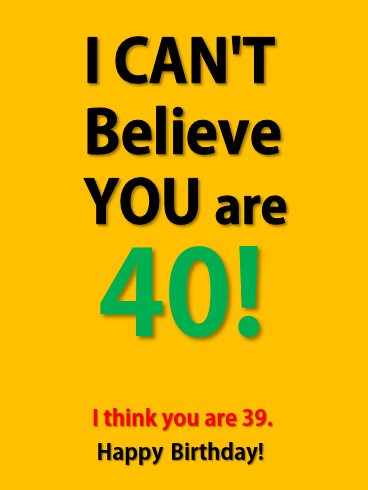 For the person in your life who is dreading turning 40, get them this gem of a birthday card and let them be 39 all over again! This birthday card is the perfect balance of sincerity and humor. After all, you're still wishing the special person in your life a happy birthday... just while allowing them to remain whatever age they want to stay! We bet your way, they're sure to love it! The variety of colors makes this birthday card stand out, while you can't help but smile and giggle at the silly, adorable cat holding balloons. This is a birthday card you definitely don't want to miss out on! Old? Says who? 50 years old might suggest old age, but you know that your loved one is very young at heart and that's all that matters. 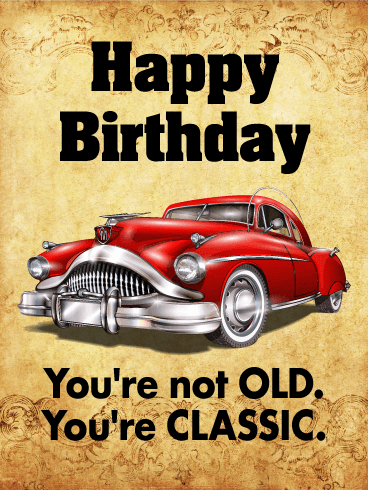 Age is just a number, so use this fun and funny Happy Birthday card to show your loved one that birthdays should always be celebrated, no matter the number involved. 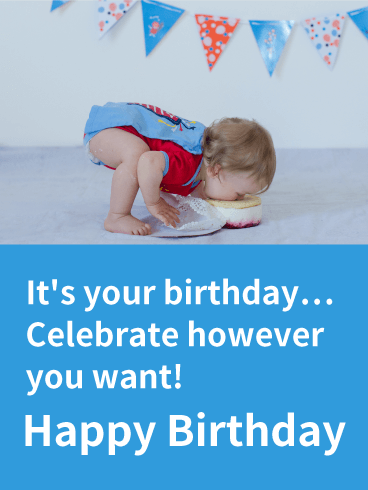 Give them an amazing birthday by sending this Happy Birthday card today! What?! You're already 50? That's crazy! Getting older is often difficult to handle, but the right Happy Birthday card and celebration can make it easier. 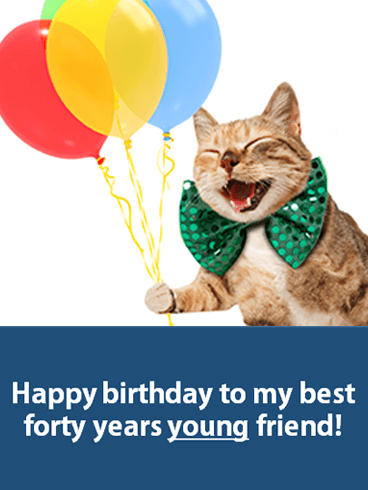 Help your loved one feel 50 years young by sending the funny cat and message on this Happy Birthday card. Laughter can make every celebration better, so give your loved one the best birthday ever by sending this birthday card today! Fifty years old? No way! 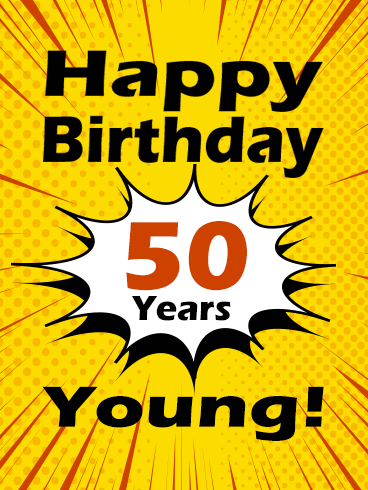 You're 50 years young! Living through half a century is no small accomplishment, but it doesn't have to mean that your friend or family member is old. 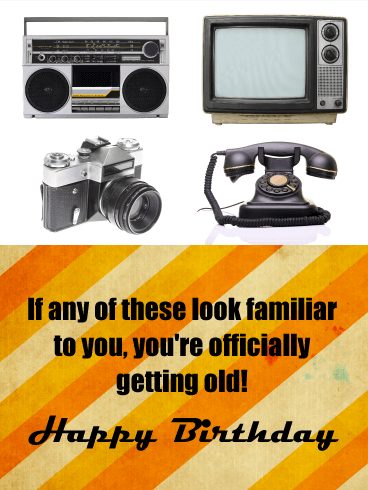 Instead, use this Happy Birthday card to show them that you still see their youth and vitality. Birthdays are an important day for everyone, so use this card to give them an amazing celebration! No matter how many years pass, your dad is still the same fun-loving, silly guy he's always been! 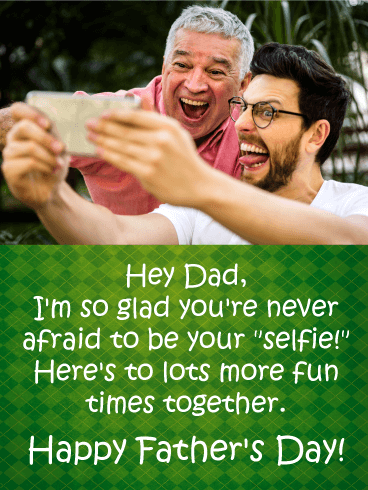 Let him know how much you enjoy those moments together with this funny, lighthearted Father's Day card that celebrates how he never shies away from being his "selfie!" You look up to your dad in every way, especially when you look at those big shoes of his that you hope to fill one day! 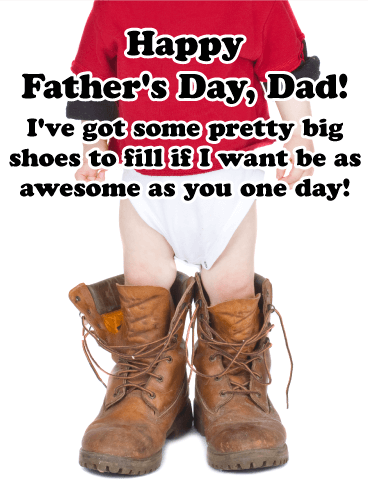 This heartwarming and humorous Father's Day card showing two pairs of shoes, side by side, celebrates the special bond you share, at any age, and how you hope to be as awesome a dad as he's been to you. Your dad is the epitome of a hard worker. 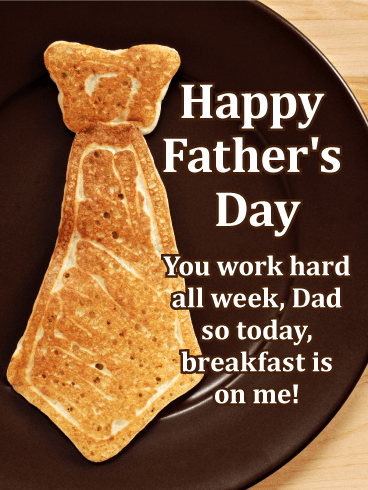 So on Father's Day, give him a break with your own version of a business breakfast with this fun card! A tie-shaped pancake will make him smile, while reminding him to take a break from the grind and enjoy a hearty meal (however it may taste!) followed by a day of relaxing at home with his family. Face it: you've got one cool daddy-o! And this silly Father's Day card is a great way to let him know! 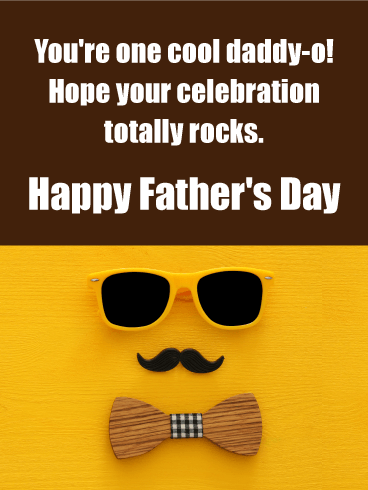 A pair of sunglasses, mustache and bow-tie sit against a rich yellow background, adding a festive touch to this fun greeting for the man you look up to in every way. What an awesome way to celebrate him on such a special day! Sure, dad can have a tough exterior sometimes, but underneath it all, he's a big softy who isn't afraid to make his kids smile, even if that means acting a little silly! This adorable Father's Day card shows a dad with his young daughter, ready to snap a pic to show off his new makeover compliments of her! It's a sweet reminder of just how much fun you have together, and how he'll always be there to fill your day with smiles and laughter. 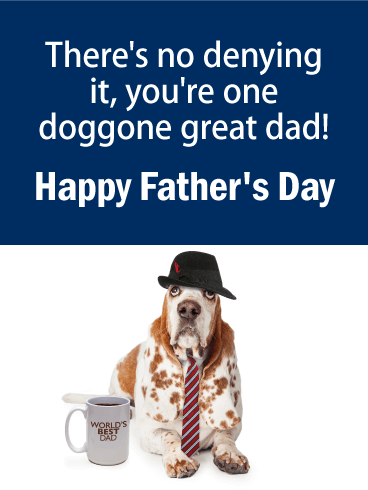 Simply put, you've got the best doggone dad around...and this funny, canine-themed Father's Day card is a great way to let him know! A cute, spotted doggie is looking dapper in his hat and tie, with a cup of coffee right nearby, complete with a special message. This simple, silly greeting will remind him just how you feel while making him howl with laughter! 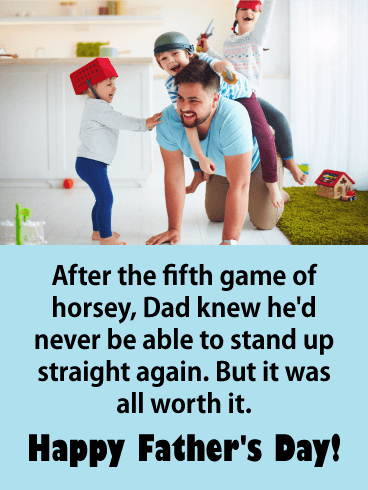 For every dad who enjoys playing for hours with his kids, even if it brings aches and pains the next day, this Father's Day card is the one for him! Sure he may not be able to stand up straight for weeks, but it's all worth it when he sees how excited his kids get to spend some time together! 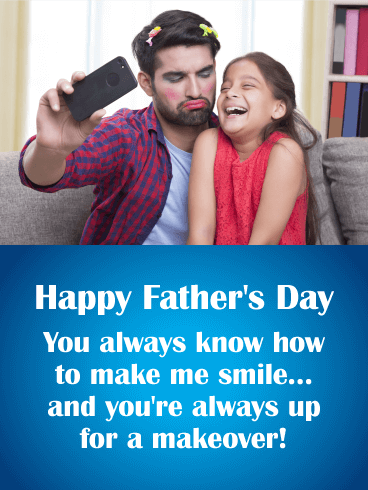 This year, let your dad know how much you appreciate all the things he does to make your happy with this silly yet sentimental card sure to make him smile. 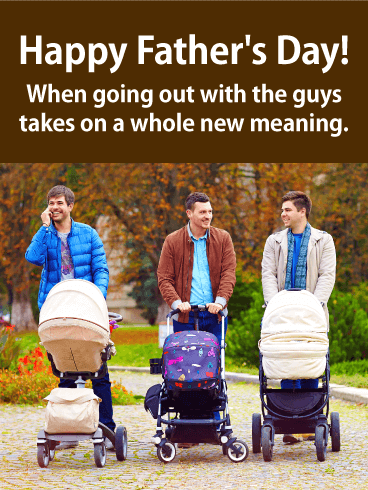 If he can still remember when going out with the guys involved drinks, laughs and cruising around without a stroller, this is the Father's Day card for him! Perfect for any new dad out there who is still adjusting to the diaper changes and sleepless nights of fatherhood, this hysterical card will have him laughing out loud as he realizes that even though times may have changed, he wouldn't trade it for the world! 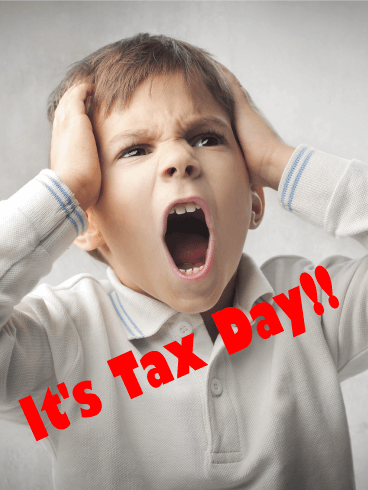 Oh no, is it Tax Day already? Doing your taxes is one of the most stressful and difficult responsibilities you face each year. As you struggle to put your receipts, income, and paperwork in order, you might feel the urge to pull your hair out because of the frustration. Instead, make Tax Day a little better by sending this Tax Day card to your loved ones and adding some laughter to these stressful days. 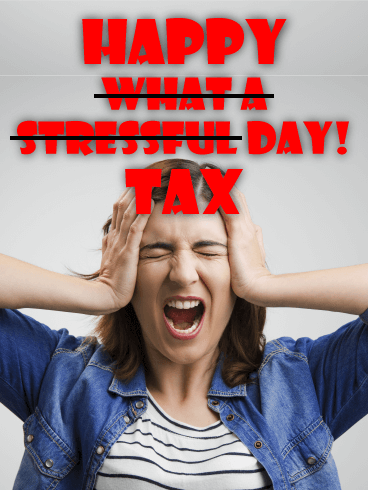 Taxes, stress - they mean the same thing, right? No one likes dealing with taxes and the stressful processes involved with filing them, but they are a necessary evil to ensure our safety and well-being. As tax season comes to a close, send this Tax Day card for some laugh-inducing stress relief. Your friends and family will enjoy the humor and feel less stressed after receiving it. Have you spent the past few weeks struggling to file your taxes? Are you excited because you just submitted your paperwork and finally get to relax? Then this Tax Day card is the perfect one for you! 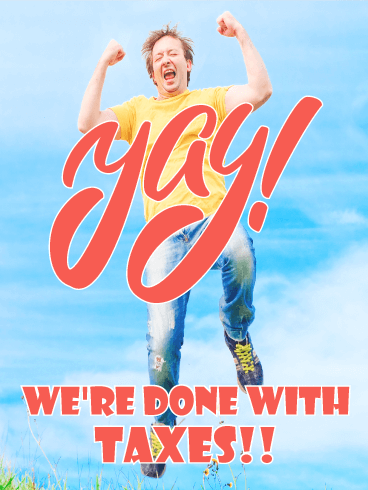 Nothing is more exhilerating than finishing your taxes, so use this Tax Day card to celebrate the end of tax season with your friends and family! You finished filing your taxes for this year? Hooray! Now that the hard work is done, it's time to kick back, relax, and celebrate! 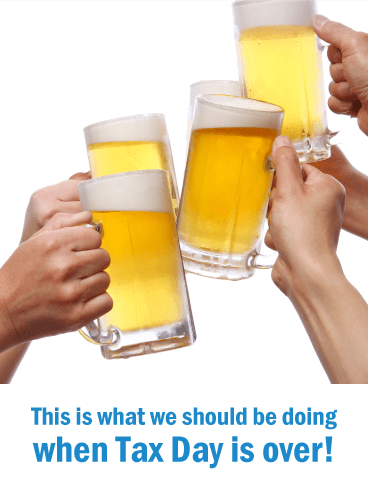 With this celebratory Tax Day card, you can show your friends that you are happy to be done with your taxes and ready to raise a drink to celebrate. This card will get them excited for the end of tax season and the good times you will have together.